Donald L Schassberger is a Doctor primarily located in Smithfield, ME. His specialties include Plastic Surgery. He speaks English. The overall average patient rating of Donald L Schassberger is Great. Donald L Schassberger has been rated by 7 patients. From those 7 patients 3 of those left a comment along with their rating. The overall rating for Donald L Schassberger is 3.9 of 5.0 stars. Shassberger did a tummytuck several years ago.Apparently,along with many bad things that happened to me due to HIS negligence,he also forgot to fold the omentum back down over my abdomen.So,years later,there is so much scar tissue and so many adhesions that I had to have Emergency Surgery to survive.Thanks a lot DOC!!!!!! !At least now,both sides of my lower abdomen are the same.When I asked him about it,at the time,he ROARED at me!!!! !He should be flippin burgers. this is a surgeon who has not kept abreast of new more advanced surgical techniques. His communication skills are extremely poor. He does not display pictures of his work any longer instead he uses a book. Since my experience with him i have met other women who saw picures of his past work and opted for another more skillful plastic surgeon. We are sorry, it looks like we don't have insurance information. Please call Donald L Schassberger's office for more information. Dr. Lopes specializes in general and pediatric urology with special interest in minimally invasive and laparoscopic urology. He has practiced in this area since 2003. 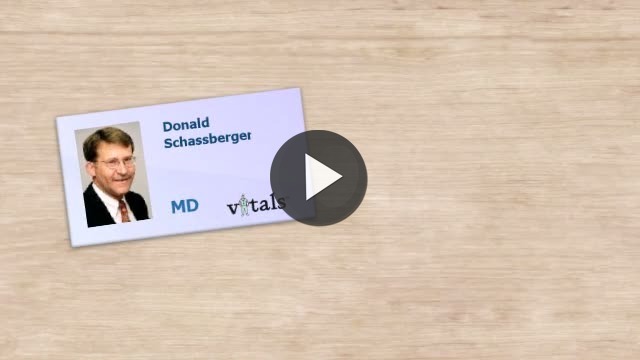 Take a minute to learn about Donald L Schassberger - Plastic Surgery in Smithfield, ME, in this video. Donald L Schassberger is similar to the following 4 Doctors near Smithfield, ME. Have you had a recent visit with Donald L Schassberger? Select a star to let us know how it was.